The new consul Publius Villius Tappulus arrives in the region too late to start a campaign against the Macedonians; he has to deal with a mutiny in the army as well. This year the Romans started the land operations of the Second Macedonian War. Both sides were eager to persuade the Aetolian and Achaean Leagues to join their side. The Aetolians were still reluctant to fight for the Romans, even though they felt little love for Philippos. The Macedonian king, in turn, tried everything within his means to keep the Aetolians out of the war, while at the same time trying to convince the Achaeans to honour their alliance with Macedonia. The Achaeans, however, were desperately trying to stay neutral in the conflict. They furthermore had plenty of problems of their own, as a war with the Spartan tyrant Nabis was looming. Before turning to the Second Macedonian War, let us first take stock of some Roman domestic affairs. Lucius Cornelius Lentulus and Publius Villius Tappulus were the consuls of this year, while Scipio Africanus and Publius Aelius Paetus served as censors. Their job seems to have been quite easy and not a single senator was removed from the senatorial roll. Scipio himself became the new princeps senatus, a position left vacant by the death of Fabius Maximus in 203 BCE. There was a serious constitutional problem with the election of Gaius Valerius Flaccus as one of the curule aediles. Roman magistrates were required to swear an oath before taking up their offices, but Flaccus was the flamen Dialis, the priest of Jupiter. This was an ancient priesthood that came with several taboos, and one of these was that the flamen was not allowed to swear oaths. In the end his brother swore the oath for him, and this compromise was ratified by the popular assembly. Also of importance was the fact that the Carthaginians began paying the indemnity that had been agreed after the Second Punic War. 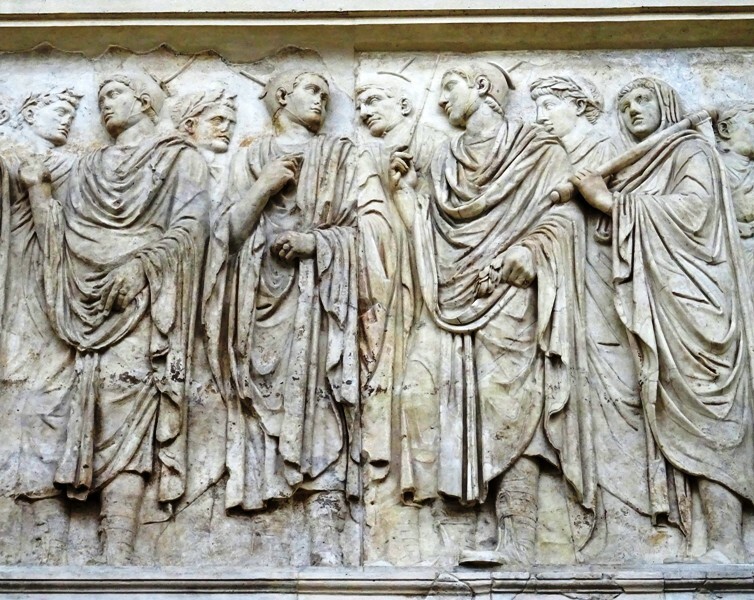 100 Carthaginian hostages were allowed to return to Africa. The praetor Gnaeus Baebius Tamphilus continued the war against the Celts in Cisalpine Gaul, but instead of emulating the great deeds of Lucius Furius of the previous year, he suffered a sharp defeat against the Insubres, losing 6.700 men. The consul Lucius Cornelius Lentulus took over the remnants of his army and dismissed the praetor, but did not achieve anything himself. Lentulus had celebrated an ovatio the previous year on account of his successes in Spain. He had won these successes with his colleague Lucius Manlius Acidinus, who returned from the peninsula this year. The Senate granted him an ovatio as well, but it was vetoed by a tribune of the plebs. Life in Ancient Rome was hardly ever fair. Philippos had not been able to save Chalkis, which had been sacked by the Romans the previous year. The king was in Demetrias in Magnesia when he heard that this important city – one of the three “fetters of Greece” – had come under attack. He had taken a small force and hastened to Euboea, only to find much of Chalkis reduced to smouldering ashes. Philippos was naturally furious and in retaliation marched into Attika to lay waste to Athenian territory. The king reached the walls of Athens itself and there personally led his cavalry in a wild charge against a contingent of Athenian hoplites. The charge took the Athenians by surprise and drove them back into the city. Livius claims that the king subsequently burned down two of Athens’ famous gymnasia, the Cynosarges and the Lyceum, where Aristotle himself had founded his school. 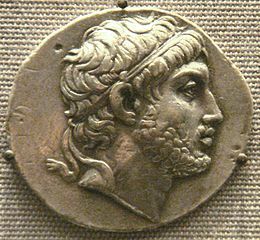 King Attalos of Pergamum quickly sent extra troops from Aigina, an island south of Athens where he had made his headquarters. The Romans for their part sent in reinforcements from Piraeus, the port of Athens. Philippos then proceeded to Corinth to attend a meeting of the Achaean League, which refused to aid him against the Romans. The king subsequently swung east again, unsuccessfully stormed Athens and Piraeus and laid waste to Attika for the second time. As usual, not even temples and other sacred places were safe from the king’s wrath. Before launching his own spring offensive, the consul Publius Sulpicius Galba sent ahead his legate Lucius Apustius for probing attacks into enemy territory. When these proved to be successful, the consul gave Apustius command of the fleet and went on the offensive himself. He first marched through the territory of the Dassaretii before entering the plains of Lynkestis in Upper Macedonia. Philippos, who had returned to Thessaly, sent out mounted scouts to locate the enemy army. The king’s horsemen clashed with those of the consul, who had also sent out some cavalry to reconnoitre. Casualties on both sides were about even, but Livius tells us the Macedonians were horrified by the terrible injuries inflicted by the Roman gladius hispaniensis, a slightly elongated version of which was also the standard cavalry sabre at that time. Philippos then decided to recall his son Perseus, a boy of about twelve years old, who had been guarding a narrow pass further to the north against Illyrian invasions. 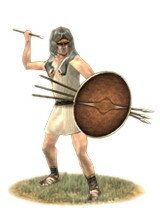 Perseus’ troops were added to those of the king, who now commanded a force of some 20.000 infantry and 2.000 horsemen. The next encounter was fought in the territory of the Dassaretii. The king had sent ahead some light troops and cavalry and the consul responded by ordering his velites and two contingents of horsemen to counterattack. The Macedonians were used to skirmishing from a distance, charging and retreating, but the Romans were eager to get into close combat. 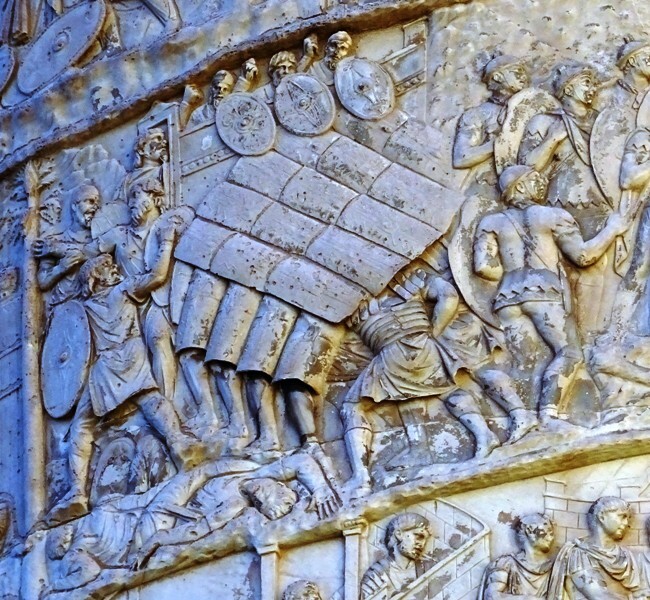 It was this aggressive tactic that won the day for Rome. The next day, a Macedonian attempt to ambush the Romans with peltasts failed miserably when these troops showed themselves too early. Another day passed and now Galba marched out of camp and offered battle to the king. He had also deployed some African war elephants in front of his lines, the first time in history that the Romans made use of these animals on the battlefield. Philippos, however, refused to leave his camp, causing Galba to march his forces up to the Macedonian rampart and call the king a coward. Since Philippos was unwilling to fight, the consul moved his camp to a place named Ottolobus (the exact location is unknown), some 13 kilometres away. It would be easier to forage there, but when the Romans were spread out to harvest the grain, they were cut off from their camp by the king’s cavalry and his Cretan auxiliaries. Many foragers were cut down before some managed to flee back to the Roman camp to warn the consul. Galba responded energetically and sent out his cavalry, the tribunes with the maniples of foot soldiers following close behind. Once again, Philippos fought in the front ranks, like a true Macedonian king. Although a Macedonian victory had at first seemed certain, the arrival of the Roman infantry completely changed the situation. The king’s horse was wounded and threw its rider. Philippos was almost captured, but managed to flee on a horse provided by one of his hetairoi. Livius claims that 200 Macedonians were killed in the fighting. He does not give any casualties for the Romans, but these must have been about equal if we count the losses among the foragers. The Battle of Ottolobus was just a minor Roman victory. Philippos had not committed his heavy infantry during the battle and he was far from defeated. But his decision to recall Perseus and take over his troops proved to be costly. Now that the mountain pass formerly guarded by the king’s son lay wide open, an Illyrian tribe called the Dardani had invaded Macedonia. The Dardani were allied to the Romans and their arrival in the Macedonian heartland prompted the king to break camp during the night and hurry towards the danger. Philippos had deceived Galba by sending a negotiator to his camp to talk about an armistice that would allow the Macedonians to bury their dead. When the consul met with the negotiator the next morning and agreed to an armistice, he suddenly discovered that the king had already left. Galba had no idea where Philippos had gone to. After collecting grain, he decided to invade Eordaia in Upper Macedonia. To prevent this, the king had blocked a narrow and heavily forested pass with troops and fortifications. But his heavy infantry proved to be of no use here. His phalangites with their long and heavy sarissas need open terrain to fight effectively and the Thracian auxiliaries were unable to wield their large rhomphaias – a sort of polearm – because they were hindered by the branches of the trees. In the end, the Macedonians tried to stop the Romans by shooting arrows at them and pelting them with rocks, but the legionaries simply formed testudo and easily drove the enemies from their positions. The consul was in Macedonia now, but it was already late in the season. After destroying the fields, he retired to his winter quarters near Apollonia. Now that the Romans had enjoyed some success against the king and the Dardani had invaded Macedonia, the Aetolians decided to enter the war as well. They were joined by Amynandros, king of the Athamanes, a people living north of Aetolia. The Aetolians and Athamanes enthusiastically invaded Thessaly, but their offensive was badly coordinated and poorly led. Their combined armies were quickly chased off by the king himself. The army of the Aetolians was furthermore weakened when Skopas, a former strategos of the League who now worked for King Ptolemaios, recruited 6.500 men to fight in Egypt as mercenaries. The Romans were probably beginning to wonder what good the Aetolians could still do. Philippos, on the other hand, had reason to be satisfied. One of his generals had caught up with the retreating Dardani, whose column was burdened by the loot they were carrying away from Macedonia. Although most of the Dardani probably managed to get away, the Macedonians had at least won a moral victory by inflicting a few casualties in hit-and-run actions. But the pressure on the Macedonians was still immense and they were under attack from all sides, not least from the sea, where a combined fleet of the Romans and King Attalos operated. The legate Lucius Apustius and Attalos first captured the island of Andros. Andros itself was given to the king, while the Romans took the loot and all the Greek art that was confiscated. The two fleets then sailed up and down the Aegean to raid enemy territory. The results of their operations were mixed, but they won an important victory at Oreos on Euboea. This city had already been captured once during the First Macedonian War, in 208 BCE to be exact. Oreos had been betrayed to the Romans on that occasion, but now they had to fight a strong and determined Macedonian garrison. The Romans and Pergamenians were forced to conduct a difficult siege, but in the end they managed to undermine part of the walls and batter it down with a ram. The city was then quickly taken and granted to Attalos, while the Romans took the prisoners. It was now September, and Attalos left for Eleusis to attend the Mysteries. Publius Villius Tappulus, the consul who had been allotted Macedonia as his province, had sailed to Greece late in the season and now took over the army from Galba. It seems likely that Tappulus arrived in Epirus way too late to go on the offensive again. He would have to wait until the next year and hope that his successor as consul would be delayed as well. The consul furthermore had his hands full dealing with a mutiny among the soldiers. It turned out that some of the “volunteers” that Galba had taken with him to Epirus had not come along all that voluntarily. They had been pressed into service by the tribunes. These men were veterans who had served in the Cannae legions and had fought on Sicily and in Africa. It had been seventeen years since they had last seen home, so their grievances were understandable. Tappulus promised the men that he would write to the Senate about their discharge, but Livius does not tell us how their story ended. It is clear, however, that whatever tiny opportunity the consul had of attacking Philippos this year was lost because of the mutiny. He had been consecrated against his will in 208 BCE. 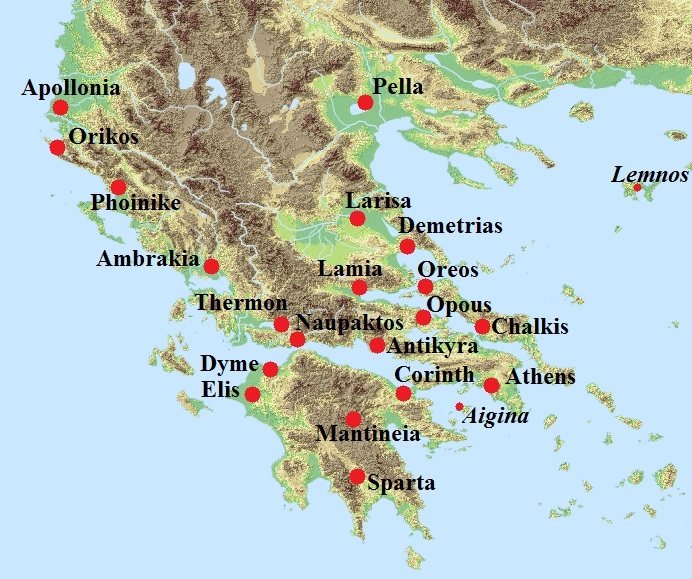 Publius Sulpicius Galba had captured the island during the First Macedonian War, in 210 BCE, and had sold it to Attalos for thirty talents.